With March comes Marchitecture and an excellent reason to try your hand at an Architecture styled creation! 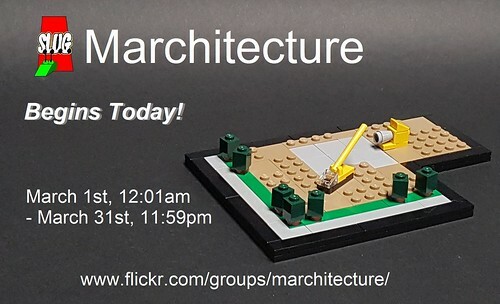 "You will have one month to build a microscale* version of a recognizable real-world building. This could be a building in your neck of the woods or one that everyone recognizes. * Microscale in this case is anything well smaller than a minifig would be used in. If you think about the general scale of the actual Architecture sets, you're probably good. The building should be presented in a LEGO Architecture style with a black border. Completed model with border should not exceed a 32x32 stud footprint."